To receive information on visiting the Rehoboth Beach & Dewey Beach Resort Area, or order a Rehoboth Beach- Dewey travel guide contact the Rehoboth Beach-Dewey Chamber of Commerce. The area is known for awesome hotels, specialty stores, amusements, beautiful homes, tax-free shopping and some of the finest restaurants anywhere. Rehoboth has a quaint small town feel – a real walking downtown and all the fun, relaxation or excitement you could ask for. Dewey Beach is just a short walk from Rehoboth Beach and is located between the Atlantic Ocean and Rehoboth Bay. 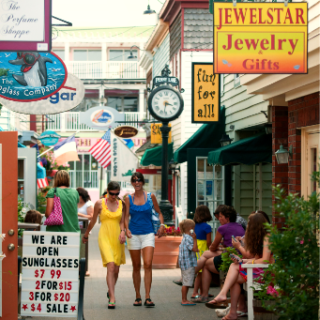 Dewey offers beach sports and activities as well as great restaurants, majestic sunsets, live music, dancing, and nightlife that is world famous for adults of all ages. During the summer, Dewey offers family activities including movies and bonfires on the beach. The Resort’s Gateway (Highway One), offers a “mile of style” at the famous Tanger Outlet Center and more great restaurants, bars, shops, rides, and attractions. Visitors enjoy exploring 30 miles of unspoiled Delaware coastline and our many parks. Nature based activities include State Parks, kayaking, nature cruises, ferry rides, walking trails, surfing, skimboarding, paddleboarding, sailing or exploring the water’s edge. Just add historical venues and live performing arts to make your stay in the “Nation’s Summer Capital” a perfect one. You will want to stay and return often to enjoy our beaches, boardwalk, natural beauty and hospitality. Bring your sandals and flip flops!